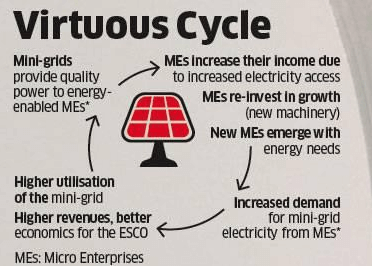 Young and hungry for growth, energy services companies (ESCOs) in India are cottoning on to renewable energy microgrids as a means of expanding their businesses and bringing sustainable, pollution-free electrical power to rural households, communities and businesses. Homes and businesses across rural India have been installing small off-grid solar PV-battery storage systems at a rapid clip in recent years. With those expanding in scale and capacity, Indian ESCOs are beginning to connect these systems in building mini-grids, creating a new B2B clean energy industry sector and markets in the process. Along with ESCOs, telecoms companies have emerged as leading players in the nascent Indian market for rural renewable mini-grids, The Economic Times highlights. In a January 21 report, ET’s Naren Karunakaran describes how a local landowner in the agrarian heartland of Bihar state is profiting from a contract with ESCO Tara Urja to add a 30-kW solar PV system to replace the 20-kVA diesel generator that had been powering a telecoms tower he maintains on his land. Having proved it can add to his profits, the Bihar landowner has since had a second telecoms tower and solar PV system installed. The telecoms tower operators continue to supply him with 29 liters of diesel a day, which he now sells on the market. Besides adding to his income, Switching to solar has also given me a lot of free time; else I was constantly tied down to the tower. I am scouting for new businesses to keep me engaged,¨ he told ET. As is the case across much of rural India, northeastern Bihar state is starved for electrical power, ET’s Karunakaran points out. It estimated that some 77 million households, about 360 million people, lack access to grid electricity across India. Another 20 million households, 95 million people, are considered under-served, receiving less than 4 hours of grid power per day. Successive national governments have set ambitious solar energy targets as a means of addressing the issue in a way that’s cost-effective and adheres to the principles and goals of ecologically and socially sustainable development. ESCOs such as Husk Power and Mera Gao Power, in turn, have realized they can leverage growing off-grid solar PV capacity installed in homes, businesses, institutional facilities in building mini-grids. With $75 million in funding, SmartPower India is working to build coalitions of ESCOs, telecom tower operators and investors. The non-profit ESCO aims to build 1,000 microgrids covering more than 1 million Indians over the next three years. Seventy are up and running in Bihar and Uttar Pradesh to date. Solar mini- or microgrids aren’t new to India. Part and parcel of the Indian government’s efforts to realize its solar energy and climate goals, a solar microgrid has been up and running on Sagar Island in the Sunderbans since 1996. Another in Chattisgarh supplies clean, renewable power to more than 1,400 households, Karunakaran notes. Aggregating and collectively managing these distributed energy resources (DERs) adds reliability, robustness and resilience to the power supply. It also improves efficiency, enabling end-users to meet more of their energy needs, while also avoiding the polluting emissions and environmental degradation associated with fossil fuel-fired power generation, proponents assert. ¨What India needs is a decentralized approach to energy access; let thousands of mini-grids emerge,¨ Krishnan Pallassana, the executive director The Climate Group, India, was quoted as saying. The Climate Group and the Goldman Sachs Center for Environmental Markets forecast that India’s installed microgrid capacity could reach around 90-MW by 2019, requiring some $250 million of investment. ¨We want to impact the village GDP through energy access,¨ SmartPower India CEO Jaideep Mukherji explained. SmartPower India is a non-profit organization established by the Rockefeller Foundation that was set up to foster development of a clean energy mini-grid ecosystem in India.